Hampir Semua komputer menggunakan Realtek HD Audio driver untuk masalah audionya. Jadi kalau sobat tidak mempunyai driver audio bawaan saat membeli laptop. Sobat bisa memakai driver ini karena dapat dipakai untuk semua jenis laptop dan komputer yang support driver ini. 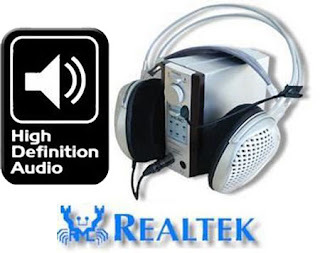 Realtek High Definition Audio Driver this is the sound drivers for a new generation of audio Realtek (HD Audio). The advantages of High Definition Audio specification before AC 97 include: full support for new audio formats, a high frequency bandwidth, support for connecting audio devices, under Technology Plug and Play, more accurate speech recognition and input. Realtek has been always leading in audio drivers/codes and has come up with high definition dirvers as well. The Realtek High Definition Audio Driver will provide you with listening capabilities for multichannel sound such as DTS, Dolby and Surround. Now you can experience the movie theater like audio experience inside your room/home.